The entire San Francisco Bay Area is experiencing football fever as host for this year’s Super Bowl 50. All the Bay Areans, whether fans of American football or not, are swept up in the frenzy of NFL promotions and street closures. 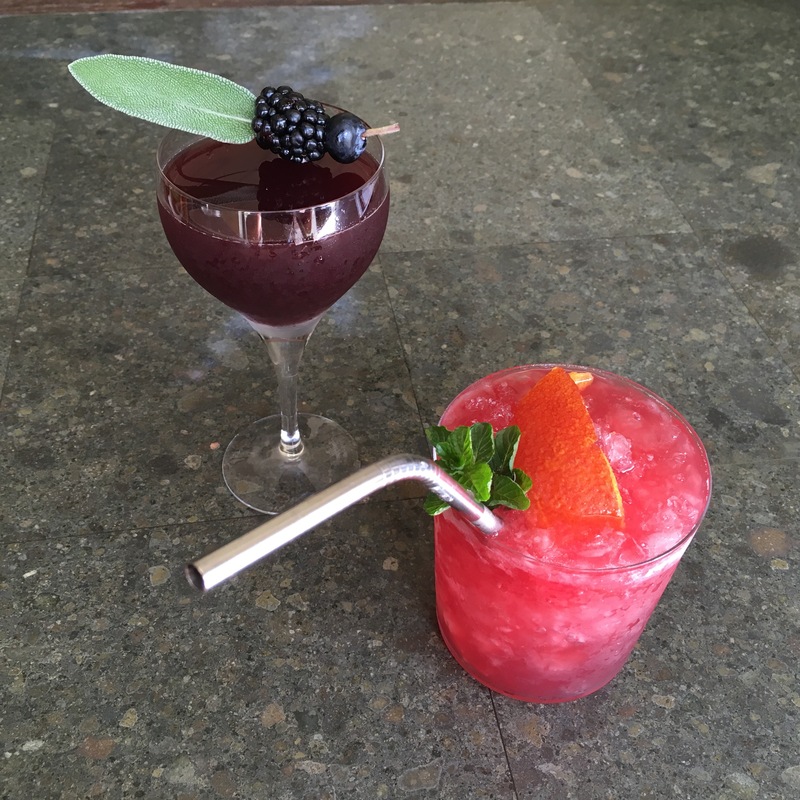 Since our San Francisco 49ers are hosting (but not playing in) the Super Bowl in their stadium, we were inspired to create a couple of team-themed cocktails to drink during the big game. Super Bowl 50 features the Carolina Panthers vs. the Denver Broncos, so we devised a couple of cocktails based on their team colors. The Panthers wear black and blue, while the Broncos sport old school blue and orange. We pay tribute to the much favored Panthers with a cocktail called the Sage Bruiser, featuring black- and blueberries. The underdog Broncos are represented with a Bloody Orange Crush. Both of the cocktails feature a whiskey base muddled with some fruit, a bitter component and herbs. The Sage Bruiser is comprised of Dickel No. 12 Sour Mash Whisky, Alessio Vermouth Chianti, sage (in herb and syrup forms), black- and blueberries. The Bloody Orange Crush uses Bulleitt Rye, Aperol, orange liqueur, blood orange juice, mint and ginger beer. 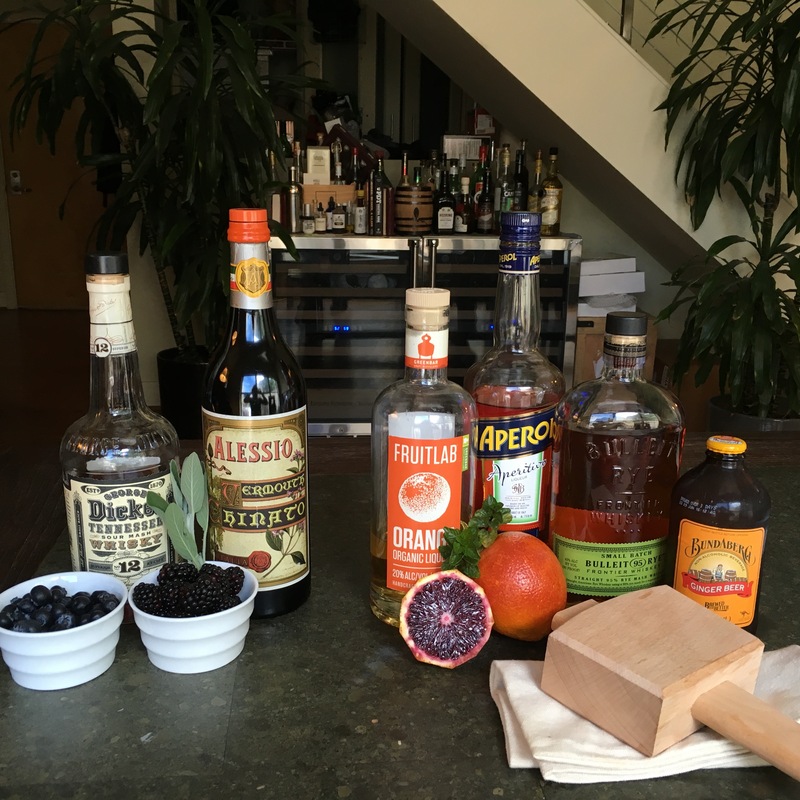 This Bronco’s-themed libation gave us a perfect opportunity to use the ice mallet and canvas bag to make crushed ice. It turns out that sage works very well with the berry flavors, adding a savory component to the Sage Bruiser (left). Regular orange juice would work with the Bloody Orange Crush (right), perhaps more color-appropriate for the Broncos; but we chose the blood orange for its tanginess and as an homage to the Denver defense (just ask Tom Brady.) Don’t get us wrong: we’re rooting for Manning to be the first quarterback to win Super Bowls with two different teams, but their injury-depleted defense and anemic offense will make it an uphill battle. Add all ingredients to a cocktail shaker and thoroughly muddle, ensuring that the berries are crushed. Add ice to the shaker and mix all ingredients until chilled. Double strain into a cocktail glass. Garnish with a sage leaf studded with a blackberry and a blueberry. Add all ingredients to a small pot and bring to a boil. Reduce heat to medium-low and steep for 20-30 minutes. Add the first four ingredients into a cocktail shaker and muddle with the mint leaves and orange rind. Add ice to the shaker and mix all ingredients until chilled. Double strain the contents of shaker into a low ball glass filled with crushed ice. Top the glass with ginger beer and garnish with an orange rind and mint sprig. Optional: garnish with blueberries to stay team color correct to add some blue.